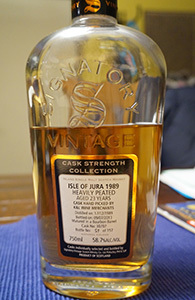 Following the official “Prophecy”, here is an older, independent, heavily peated Jura. This was bottled by Signatory for K&L in California, and is one of the few of K&L’s selections for 2013 that I thought was pretty good. I didn’t like it so much from the get-go though. I first opened it for one of local group’s tastings and at the time I thought it was fine but nothing more. The group (who tasted it blind) seemed to agree and it didn’t do very well in terms of either ranking or overall score. I let it sit in the bottle for a few more months and then brought it back to another of our tastings (the photograph was taken right before the second tasting, and the notes were taken the night after). Lo and behold, the whisky seemed to have improved dramatically in the bottle and it took top honours for the night (everyone but me again drinking blind). Yet more evidence of how dynamic a whisky can be and how misleading reviews based on single samples (as so many of mine are) can be if they’re presented or taken as comprehensive pronouncements (as I hope mine aren’t) rather than as snapshots of a particular tasting experience and moment in a bottle’s life. 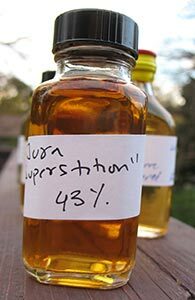 I don’t have too much experience with Jura and I can’t say I’ve liked any of the (few) official bottles I’ve tried very much—see here for my review of the “Superstition”. The “Prophecy” generally gets better reviews, however, and so I’m intrigued. And no, I have no idea why these whiskies are called “Superstition” and “Prophecy”. I’m not usually a fan of the overly farmy variety of peated whisky, though I have liked some young Ledaigs of late. Where will this one fall? Nose: Very strong farmy notes, rotting compost and probably a critter or two in there too. Calms down as it sits and sweeter, inkier notes come out to join the organic notes which are now more leafy than rodent in origin. There’s some fruit buried deeper down but I can’t quite pick it. Let’s see if time and/or water pull it out. Yes, with water there’s citrus (lime) and something muskier too. A bit of vanilla and cream too now. I have very little experience with Jura. I’ve had the 16 yo and that may be it (I have a vague memory of perhaps trying a couple of indies, but that was before I tracked these things and I may well be confusing them with something else, maybe Tobermory/Ledaig). This Superstition, a NAS, peated malt, is somewhat controversial. A lot of people I know online dislike it quite intensely. On the other hand, the friends who shared this sample with me like it a lot (they’re part of our local tasting group) and on their recent trip to Scotland this was one of their favourite whiskies*–and neither of them is an undiscriminating peathead, given to loving anything peaty simply on account of it being peaty. So, I’m intrigued to give it a go. *Correction: This was a peaty whisky they enjoyed in Scotland but it was not one of their favourites on the trip. The sample was poured a couple of weeks ago from a freshly opened bottle. Nose: Sour at first then turns sweet in an herbal kind of way (in a root beery kind of way–not that this smells like root beer). Quite gingery but not particularly smoky; there’s some leafy, farmyardy peat–something rotting in wet undergrowth. With more time there’s some darker sweetness (some caramel); but then the sourness comes back again and now it’s a little vinegary. After a lot more time there’s a whiff of a stale ashtray into which water has been poured. Now with an actual drop of water the vinegariness recedes and there’s just a hint of lemon. Palate: Somewhat thin mouthfeel and a somewhat indistinct jumble of flavours as pretty much everything on the nose kind of runs together. After a few more sips the peat is a little more evident and there’s some bonfire smoke (wet wood) and there’s that herbal sweetness too (with a bit of leather as well). With more time that gingeriness comes to the fore (powdered ginger)–reminiscent of the Glen Garioch Founder’s Reserve and also some Amruts (though this does not have any of the other qualities of most Amruts). Wait, a little bit of fruit seems to emerge late, but I can’t quite pick what it is. With a drop of water the fruit does become more expressive–dried apricot maybe? Finish: Longer than expected. Mostly bitter caramel with some smoke on the edges. Water takes some of the bitter edge off. Comments: Well, I do not like this as much as my friends do (or one of them at any rate) but nor do I find it particularly objectionable. Sorry to be boring. It seems like many other young whiskies, with the peat here probably masking some more obviously youthful notes; indeed, it’s not a million miles from some young Ledaigs. The late-developing fruit lifts it out of the high-70s. Rating: 82 points. A little more texture and less sourness on the nose might have taken it higher. Thanks to Clara and Rob for the sample!